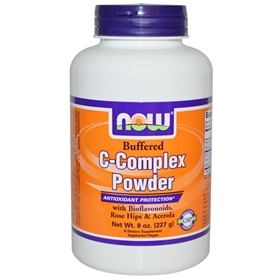 Vitamin C-Complex Powder - 8 oz. Vitamin C is perhaps the most popular vitamin known to man. It is consumed in a supplemental form by millions of people across the world for its antioxidant properties, which are well-documented in medical research. Calcium Ascorbate is an optimal nutritional supplement that combines Ascorbic Acid (Vitamin C) with Calcium Carbonate. By combining these two dietary ingredients, we have created a buffered source of Vitamin C that will not contribute to gastric irritation in sensitive persons. Vitamin C, is a potent antioxidant with increasingly diverse uses in health promotion and disease prevention. Suggested Use: As a dietary supplement, take 1/4 teaspoon (slightly rounded) 1 to 4 times daily. Mix into orange juice or other strong tasting juices to mask the taste. Free of: sugar, salt, starch, yeast, wheat, gluten, soy, milk, egg or preservatives. Vegetarian Formula.